Dave started the rigging off down the entrance pitch, a 20 meter deep crack on the surface. Peter, Mel and I soon followed him down and all chose the wrong way on at the bottom. Coming back out to the pitch again, it turned Rhys had overtaken us going the correct route. This was an entertaining vertical squeeze that led to short crawl, and then some stooping until breaking out into a passage with a short traverse over a streamway which Dave started to rig. Once he reached the pitch head at its end, I came over to pass the tacklesack of rope I had been carrying, but seeing that he had a fair amount of rope remaining and it looked like the bottom of the pitch was in sight I paused before handing him the bag. “Why,” I reasoned, “would there be a separate rope just for the traverse? It looks like there's enough here for the pitch. We can always take a couple of knots out of the traverse line if we need a little more.” Seeing the sense in what I was saying, Dave rigged the Y-hang with the traverse rope and went on down. He soon found himself out of rope with 20 metres of air between his feet and the ground and was forced to come back up. The pitch was a bit bigger than it looked from above. As Dave had had enough of rigging for the time being, I was to be the one to rig the pitch. I was told that there was a bolt somewhere, and that after that there was a deviation? Anyhow, down I went to have a go at rigging what might have been my 2nd or 3rd ever rebelay. I saw quite a few rub points, but not any bolts, until I reached the point where the pitch opens out and it was clear that whatever it was I was looking for, I had gone past it and needed to come back up. At that point I then realised that I couldn't undo the maillon holding my hand jammer to a gear loop on my harness with my hands which were starting to get numb from the water coming down the pitch. I hadn't remembered to bring my penknife that day, and a knife seemed like the only thing that would help me at this point, so I shouted up for someone to clip a knife to the rope and drop it down. In hindsight a spanner would have been better, but this was a decision I made while stuck dangling in mid-air. I was told afterwards that there was some confusion as to what I needed a “mife” for, but eventually there was a cry of “BELOW”, followed by the sound “pshshshshshshshshshshshshshshshshshshsshshshshshhshsDONK” as Rhys's penknife came down the rope and bounced off my helmet. After cutting free my jammer, I started to come back up, and saw the solitary bolt that Dave had said he saw, but was unable to reach. It did look pretty unreachable, about 5m away with a flake of rock in between that the rope would get caught on. But it then occurred to me that I would have a better chance of reaching the bolt if I descended down the other side of this flake. But when I did that I found that gravity was threatening to pull me across the flake, and the further down I went, the harder it was pulling me until I decided that it just didn't seem safe to keep going, and had to give up. At this point I noticed another problem with my hand jammer – it wasn't there any more. The knot in my shock cord had quietly become undone at some point and the jammer must have gone down the pitch. Rhys then had to pass me down his own in order for me to get back to the top. After two hours there were now two Y-hangs on the pitch head, a club harness had lost a gear loop and a hand jammer had gone missing but we were still pretty much where we had started. We were sorely in need of leadership from the president of the club to get us through this dark hour. But what Rhys had apparently forgotten in all the excitement was that the reason why the bolt was so difficult to reach was that a deviation was needed about a metre or two down the pitch. But thinking that a wild swing across was the only option there was, and proving that with the power of belief you can achieve anything, after about 5 minutes on the rope he somehow had done it as there was a cry of “rope free” and it was over. I found my hand jammer at the bottom, and after everyone was down a plan was formed – get lost in the system for a while making a token effort to find Lancaster and make our way back out the way we came in the likely event we couldn't find it. For once though we we were in luck. Pretty much as soon as we started moving we bumped into a caving team heading in the opposite direction who were also going to Lancaster and seemed to know what they were doing. So we followed those guys the rest of the way which was straightforward enough, but for a brief period just before the entrance pitch where there were route finding difficulties. Although this was only for 20 minutes at the most, it had quite a strong affect on the person who I think was the leader of the other group. I was bringing up the rear following everyone else up a very weak stream in the floor when he dropped his tacklesack and staggered off in a completely different direction muttering the word “bugger” repeatedly to himself. I left him to his own devices until the word was passed down that someone needed to go and get him. As I was last, the job went to me and I went back to the abandoned bag with no-one in sight, and was considering leaving an arrow in the mud next to it indicating the way on when he returned from a side passage and I could reunite the lost man with his friends. Up the stream a little further was the entrance pitch and we were out. Me and Dave went back to Cow to derig as no-one was expected to be coming up it. I lost a game of rock-paper-scissors and had to derig Fall Pot, the large pitch we were struggling with earlier. There was then another stroke of luck. When I got to the traverse, James and Jarv were there! (but not Tanguy or Guilio who I had somehow bypassed on my way down). They had decided to cut their trip through Easegill short with a cheeky escape up Cow, taking up our rope for us while doing so. They weren't too impressed with the rigging, but it did mean at least that I didn't have to go down there again. Another weekend, another ICCC trip. Things started badly when I forgot my harness, and Dave W had to scare up a spare one so old that it still had some carbide attached. Our trip descended further into farce as we got to Easegill and found twenty other cars. Then both Tamzin and Eli realised they had no harnesses, having brought an extra chest harness each instead. Our trip was quickly changed to be County pot to Wretched rabbit, with a quick trip via Link to rig for an exiting team. We walked across the muddy valley, singing 'Under the sea' with such gusto that even Oli joined in. Link rigged, we walked upstream to County, intending to do it as a pull through. Both pitches was already rigged, so we just went down those ropes, meeting the groups heading back up to derig them as we descended. Two cavers from Craven jokingly offered to sell us some harnesses - we’d been sharing our two between the four of us by hoisting them back up the rope after descending. Eli then pulled off his glove and sang the lyrics to ‘Under the Sea’ that he’d written on the back of his hand. The two cavers backed away, impressed by quite how doomed we were. I confidently lead us down the obvious streamway, looking for Poetic Justice. Eventually, the streamway ran out, and I admitted we needed to turn back. Fortunately, my camera still had the photos from the last Country trip I’d been on, and I identified a column to look for to prove we were on the right track. Poetic Justice seemed a lot easier to climb this time, and we descended the last pitch on the other side, just before SWCC came to derig. Now we had no choice but to find the exit via Wretched Rabbit. Unfortunately, none of us actually knew the way. I half-remembered Rhys telling me it was the first right turn upstream, so we left our rope bag there and went to have a little explore, not yet realising we were lost. We went up into Eureka Junction and Stop Pot, met up with some Edinburgh cavers and got through to the stunning cavern with thousands of straws on the roof. 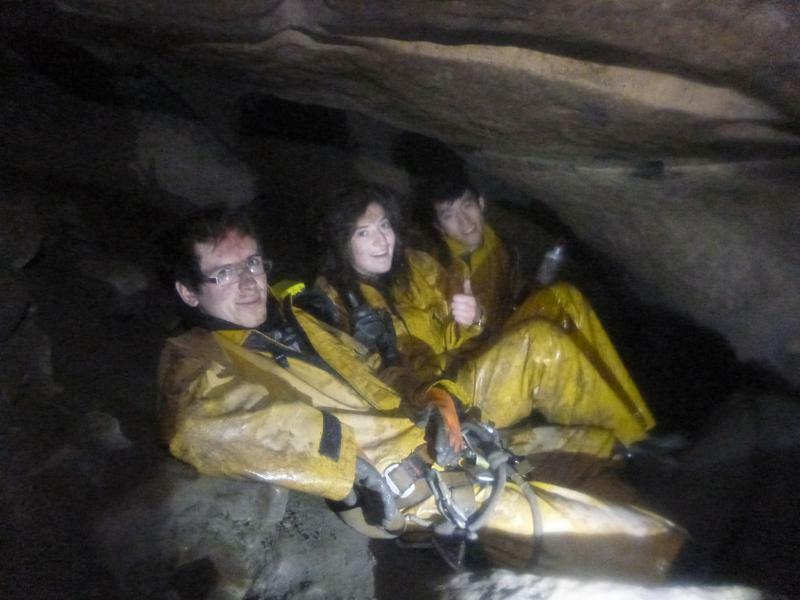 Then we turned back, retrieved our rope bag and confidently strode up the first right turn upstream to exit the cave. This passage terminated in an 8m tall torrential waterfall. We realised we couldn’t climb it, and Oli said it looked nothing like the Wretched Rabbit he remembered. Disheartened, we turned back, and began to search the other cave passages. Rereading the tiny laminated instructions (that didn't really cover our part of the cave) and exploring every side passage we could left us exhausted and more than a little worried. It had been two hours of searching, and we thought we'd covered everything. I reread the instructions one more time, and spotted one tiny line in italics that pointed the way to Stop Pot, from which we could exit to Wretched Rabbit. We jumped up and waded quickly through the boulder choke towards what we hoped would be an exit. As we entered Stop Pot, I sniffed the air, and realised we must be going the right way. Dave W was also meant to lead a group out of Wretched Rabbit, and the air in Stop hung heavy with cigarette smoke, a sure sign he'd been there only minutes before. We climbed the boulder slope and into the Wretched Rabbit escapeway. Jarv scared off the freshers I had recruited for a second attempt at reccing the Rowten sumps in Valley Entrance so this plan was aborted. But it was a moot point as James and Rhys had taken the minibus to Easegill to derig Link, and by the time they had come back it was too late for anyone else to go caving either. William was desperately trying to convince Mel to come drown with him, so I gave a full and accurate description of what it was like to free dive a long sump with no mask, and related the extremely vigorous response of the Rowten sumps to surface rain, Rupert's cave diving experience when he came back through the sumps (diving) to find that he 'surfaced' at the end of the line, and the experience of the would-be Rowten sump free diver who narrowly escaped certain drowning in Mud River in 2007. A couple of hours later it started to rain heavily.